Bandit is a spunky 10 yr old green cheek conure-awfully cute but with a tiny bit of an attitude. S/he dearly loves his people. He does bite, but usually not too hard. Bandit was once featured as the pet of the month on a pet website. He says a few words such as Mommy, nite-nite Mommy nite, and Hi Bandit. He also will talk to you with kissy sounds- up to 6! If you kiss once he`ll do it once, you do it twice he`ll do it twice- it`s very endearing! He likes his toys and will bang them around and clang his bell when excited or mad-i.e. If he doesn`t think he`s getting enough attention. He likes to sit with his head under a bell like a hat. He prefers routine and goes to each nite at 9:30 each nite, with a nite light of course! He prefers to be covered at night with his black sheet his mom sent with him. Thus far, in his life, far Bandit has not learned to eat many fruits or veggies so he will need some work in that area. Drinking juice from a cup is something he enjoys though. He will step up onto a gloved hand and will usually put himself back into his cage in the evening just around bedtime. If you adopt Bandit he comes with a bonus - a friend named Luna - a beautiful little 4 year old lovebird. Luna loves her older sibling very much. If you think you`d like not one, but two lovely birds to chatter it up in you home ask about Bandit and Luna! Luna is a four year old lovebird that is quite friendly and loves attention. She also adores her older sibling Bandit, a 10 year old green cheek conure. She absolutely has to be near Bandit all the time or she gets quite upset. 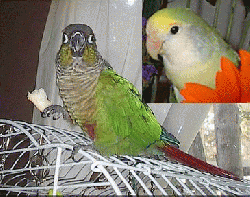 She mimics his conure sounds, wants to try to do what he does and eat what he does. She has an aversion to bright colored foods for some reason though- i.e. anything red. Her favorite thing to do, besides, observe Bandit, is to swing on her swing. She has been know to cuddle, and never bite, but doesn?t really know how to step up, per say. She will allow her person to scoop her up in their hands. She responds to her name by chirping. She was even featured as a pet of them month on a pet website once! Luna?s Mom had to give up she and her older brother Bandit d/t severe allergies which developed rather suddenly. She?d like to see Luna and Bandit placed together in a loving home. If you want not one, but two, birdie buddies to keep you company contact Mickaboo and tell them you?d like to meet them.